Pawn Apple iPhone for Cash in Mesa! We often forget how valuable our phones can be since we seem to get a new one every few months. That’s one of the best things about owning an Apple iPhone though, is that you can Pawn iPhone for fast cash with a pawn loan in just minutes. 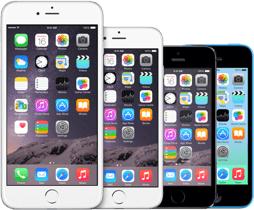 Your small Apple iPhone that you carry in your pocket every day can be pawned for hundreds and hundreds of dollars in just a matter of minutes at our local Mesa pawn shop. The cash pawn loan is only written out for 90 days, so either you can come back after Pawning your iPhone before then and pay us back, or wait the 90 days and pay us then. Either way, it’s the easiest fastest way to get the fast cash at our pawn shop you need. Proudly serving the areas of Mesa, Chandler, Tempe, and Gilbert, we’re always working hard to ensure you’re getting the most cash you need. So What’s Required to Pawn iPhones? Nothing really! Just the typical accessories you would need in order to actually use the iPhone. The obvious most important one is the charging cord and charging brick so that we can test the phone. The next important thing is concerning something called an ESN which is a number specific to each individual cell phones to keep track of them. Why this matters is if the phone has been reported stolen at some point, or if you’re still making payments on the phone through your carrier, the ESN will be labelled as “dirty” meaning that the phone is unusable except by you until the situation is resolved. This poses an issue for us as we can’t use the phone if we have to resell it or something of the sort, so we won’t be able to take phones like this. Most of the time, this isn’t an issue, and if you’re curious about your ESN there’s many websites you can use to check such as Swappa. The last thing we need to talk about is iCloud. Before you we can Pawn your iPhone, we have to have you log out of iCloud on your phone. Why, you may ask? It’s because of iCloud’s ability to lock an iPhone remotely from a computer. If, for whatever reason, the phone were to become locked while in our possession it would become useless to us immediately meaning that the whole purpose of a “collateral loan” would be defeated as your collateral is now worthless. You don’t have to remove iCloud before you come down to our Mesa pawn shop, we’ll be more than happy to assist you in removing it on the spot. Don’t worry about having to log out — it does not remove any of your personal data or anything of the sort, and you can just log right back into it as soon as you get it back.